Bid on an array of books, CDs and original invented instruments. The Window Gallery at the Center for New Music presents the work of contemporary makers of unusual and newly invented musical instruments; both emerging artists and recognized pioneers. The emphasis is on originality in concept and design, recognizing the seminal role of the search for new sounds in the expansion of musical horizons. Equally essential to the exhibits are notions of beauty, craft, and humor. 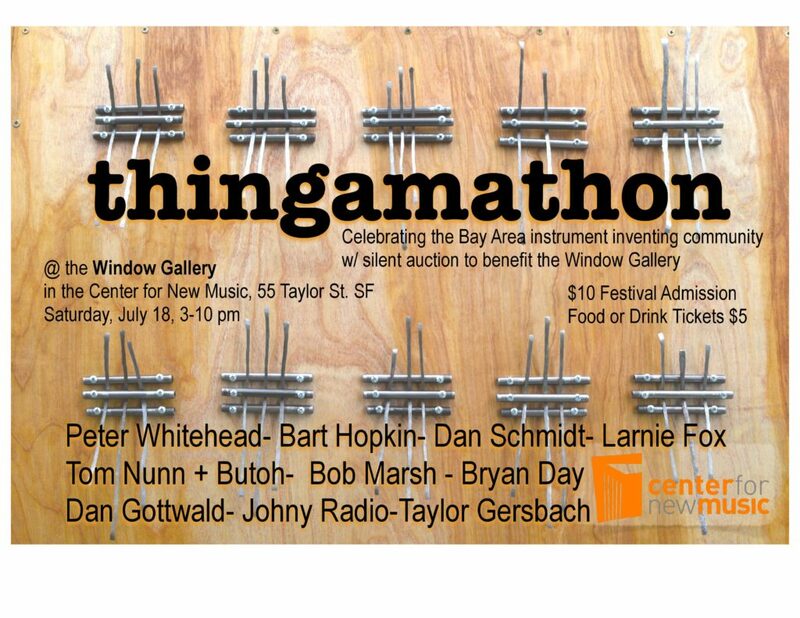 Join us in a celebration of the Bay Area’s thriving instrument inventor community; all proceeds will benefit the Window Gallery. Can’t attend? You can still support the Window Gallery’s one-of-a-kind exhibits by making a contribution to the cause. Donations by check may be sent to Center for New Music, 55 Taylor Street, San Francisco, CA 94102. Be sure to write “Window Gallery” in the memo line. Your contributions are tax-deductible!